Wrapped in wood, this cozy ski lodge is a joy to come home to after a day in the great outdoors. This peaceful retreat sits between Ruapehu's Turoa and Whakapapa ski-fields allowing guests to make the most of their ski holiday - simply choose which field has the best conditions on the day. 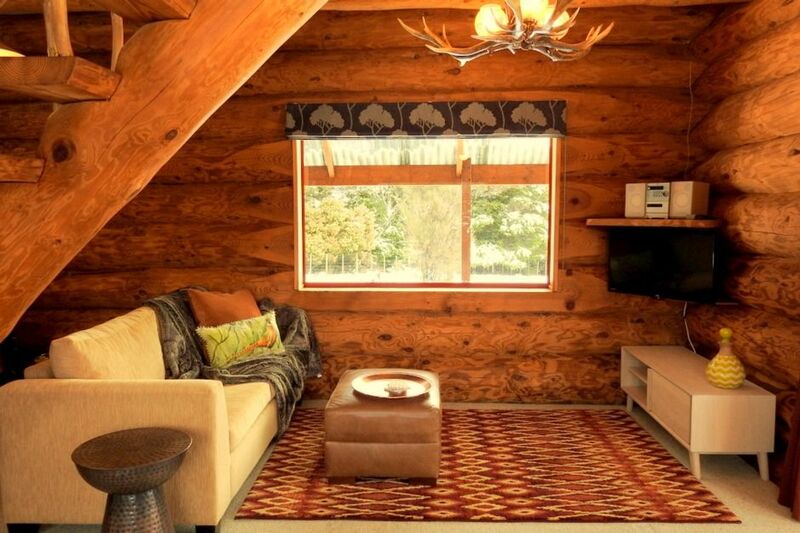 During the day, enjoy easy access to ski slopes, bike trails and Ohakune village. At night snuggle up with friends or family around the log fire to catch up on the day, cook delicious meals from well equipped kitchen and watch a DVD. Later you can challenge your party to a game of monopoly or end the day with a long soak in the outdoor tub. The outdoor bath fits 2 comfortably and is perfectly positioned on the deck for looking out over the bush and the mountain, or at night - for star gazing. It is fed by an infinity gas hot water system. All bedrooms are accessed from the tree trunk stairwell. The master bedroom houses a queen bed and desk space for your laptop. The second bedroom consists of a queen bed and a 'bunk room' - a cozy space enjoyed by kids and adults alike. The bunk room is separated for privacy by a permanent dividing wall. The sunny little balcony off the bedrooms is the perfect spot to enjoy your morning coffee and soak in the views. Beds are made up on your arrival and freshly laundered towels are provided. Ski and bike storage is easy in the covered carport while the log fire and drying cupboard make getting you gear ready for the next day easy. Children love the log cabin (and arguing over who gets the top bunk). For their safety a stair gate and a fire guard is provided. The cabin is located off SH4 near the northern exit of the "Old Coach Road" cycle-way in Horopito. Ohakune and National Park Village are both a short drive away making this a great location to access the region's skiing, cycling, golfing and hiking. Please note WIFI is not available at this property. Outdoor tub on the deck with bush and mountain views. My wife and I recently spent a few idyllic days at Olivia's chalet. The chalet is gorgeous and knowing that it was made by hand was very special. It had everything we needed. We would love to return to Chalet Lahar in the winter and see this unique little house in the snow. Fantastic location and amenities. Loved the log cabin. This is the second time we have stayed and we absolutely love it here. The views are incredible and the cabin is so comfortable and well located. We will definitely be back! Lovely spot enjoyed by us all. Our granddaughter found it very exciting place to stay and it was nice to be able to bring the dogs with us. Will definitely stay again. Thanks Sara and Colin. Beautiful location. Lovely tub. Quiet serenity. We loved the view and set up of this perfect sized camp. Everything we needed was set and ready to go. The Lodge was one of the best locations we have stayed at. Lovely wooden lodge with picturesque surroundings.